The model 113.13 is a liquid-filled mechanical pressure gauge with plastic case. The liquid filling causes damping of the internal components and contributes to an increased vibration resistance and shock resistance. 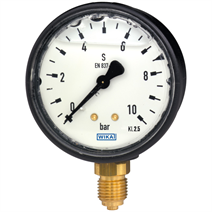 The pressure gauges are suitable for installation in machines and plants where vibrations and shocks are expected. These pressure gauges are based on the proven Bourdon tube measuring system. The deflection of the Bourdon tube is transmitted to a movement and indicated. The plastic case and the window are welded together and an O-ring seal seals the process connection at the case. In this way the instrument fulfils the high requirements for IP65 ingress protection. With accuracy class 2.5 and the available nominal sizes 40, 50 and 63, this model is suited for a wide range of applications in industry. The mounting bracket, which is available as an option, enables the panel mounting of pressure gauges with back mount process connection. The nominal size 63 mm version with back mount process connection is alternatively offered with a mounting flange on the front of the instrument. This mounting flange is used, when, for example, panel mounting is only possible from the front.